If you’ve seen Sunday’s True Blood episode, Beautifully Broken, then you may be wondering about Nazi werewolves. Well, those werewolves really existed (although not exactly like that). We’ve mentioned Hitler’s werewolves before, but I’m going to share a little more about them. In 1923, a man known as Fritz Kappe created a terrorist group called Organization Werewolf. 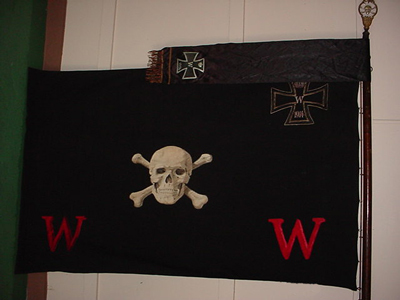 Their official banner looked a lot like pirates’ old Jolly Roger – a black flag with white skull and crossbones. In the beginning the group’s movement spread very quickly throughout Germany, but due to arrests by the Weimar government, the Werewolves never grew into a force that caused any real threat. It’s likely that the group was created in response to Adolf Hitler’s desire for Germany’s youth to be like werewolves – cruel and harsh, people that wanted to destroy humankind (history books say that Hitler was obsessed with wolves and werewolves and wanted his men to be more like them). Toward the end of World War II when the collapse of Nazi Germany was at hand, Josef Goebbels revived the Organization Werewolf after Heinrich Himmler’s speech in 1945 calling for a new Volksstrum (a militia) to harass the allied lines of communication in occupied Germany. 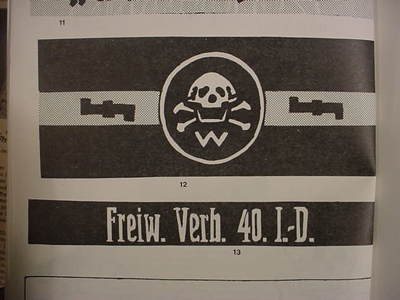 The organization regrouped and used a black armband with a skull and crossbones and a silver S.S. as their new insignia. Their main job was to assassinate and terrorize anti-Nazi Germans and ally troops. In Leipsig, female werewolves poured boiling hot water from windows of houses onto the heads of allied soldiers passing by. In Baden, they killed a number of sleeping French soldiers. Even after the war ended, the Werewolves continued their terrorist ways. At the Nuremburg trials, many Nazi leaders testified that the Werewolves were now under the control of the infamous Martin Bormann, who had somehow managed to escape capture. The Werewolves resurfaced in 1994 when Steven Spielberg’s film about the Holocaust, Schindler’s List, was scheduled to open in Russian theaters. Members on the group who were arrested by Russian security forces confessed that they planned on bombing Moscow theaters showing the movie. These Werewolves, estimated at about 100 strong, said that they took their name from the Nazi secret police operation that went underground once Hitler’s troops were defeated in World War II.